Subscribers to the Displaced Dispatch already know that our next free giveaway is a signed copy of today’s featured book! If you would like to enter the draw for this great prize, sign up for the Displaced Dispatch before Friday by clicking here! In 2003, when the shockwaves of 9/11 still echoed through the US and the country was fighting two wars in Muslim countries, Matt Krause met a beautiful Turkish woman on an airplane and decided to follow her to Turkey. This is the story of what happened there. Matt figured adjusting to life in Turkey would entail some challenges, and he certainly wasn’t disappointed. He survived bomb attacks, lost his cool around beggar kids, drove a jewelry business into the ground, and got into fistfights over parking. Along the way though, he saw beauty in ruins older than the Roman Empire, was wowed by tales of Bulgarian freedom fighters, tried not to hit cows in the road, and drank plenty of peach-flavored Lipton iced tea. 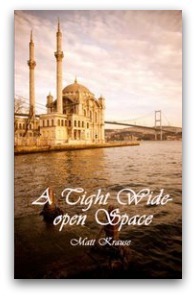 Matt Krause met and wooed his Turkish wife-to-be in a way seldom seen outside Hollywood scripts. A chance meeting on a flight from San Francisco to Hong Kong; Matt’s sixth sense inkling that this woman was The One; his Google search for her name upon his return (“I sent her an email and tried not to sound too much like a stalker”); his impulsive decision, a few short months later, to rent out his Seattle home and follow her back to Turkey (“I thought about the situation for about 10 seconds and then I said ‘Well, I’ll come with you. '”) — yes, there’s a Valentine’s tale there, all right. The book is a stimulating mix of the anecdotal and informational: first-hand accounts of the (excellent) Turkish health care and (not so excellent) law enforcement combine with Turkish History 101 and swift lessons on the Ottoman Empire. Running like a silver thread through these yarns is the deeply personal and affectionate — the reason for Matt’s presence in Turkey. The love story. For all that this is a love story, however, Matt pulls no punches in the telling of it. The introduction chapter, a description of the slaughter of a ram for Kurban Bayram (Feast of the Sacrifice) is vivid — lurid, even. Yet it gets the point across as little else could: that a guy who has spent thirty-three years in the haven of America’s West Coast is now a long distance outside his comfort zone. What on earth had possessed me to act like that? I had just blown up at a little kid on the street in broad daylight. I had just threatened to snuff the life out of a little boy barely tall enough to reach my belt. I hadn’t even been in Turkey for three months yet. What was I becoming? In the face of this engaging frankness, it’s impossible not to get drawn into Matt’s story. His frankness extends to accounts of his wedding, a trip to hospital, an almighty row with his new wife. A book — appropriately enough, for Valentine’s Day — written from the heart. As I have no plans for a subheading called “Spoiler Alerts”, I will say no more — except that the book’s twists and turns along the way only remind us that, yes, this is indeed real life. One thing I learned early on about Turks is that you can never go wrong with a big smile and an enthusiastic introduction. When we meet someone else, someone from another religion, or another country, or even another profession or another social class, it is our duty to that other person to remember that our understanding of that person is probably incorrect. And it is our duty to ourselves to overcome that incorrectness. Home is not a place. Home is not Seattle, California, Texas, Ohio, or Kathmandu. Home is the people we love. At around 190 pages, this is an easy read, but by no means a shallow one. Whatever Matt’s plans might be for the future, I hope they include more writing. STAY TUNED for Wednesday’s Random Nomad post. Have you ever read John Grisham’s The Partner? The ending to that one? Noooooo!